UPDATE 7/12: This post is part of a broad series helping to simplify the development experience of Windows Phone apps. The beginning of the series can be found here. In architecture a blueprint must exist before a house or office complex can be built. Without the blueprint there would be mass confusion and little if anything would ever happen. The final product would be disaster. The same concept applies to software especially on the phone. If you just start coding the resulting app would struggle to be coherent or usable to the consumer. In order to prevent this we need some kind of software blueprint to help the developer stay focused and deliver what is desired and intended. Over the last 3 years here at InterKnowlogy I’ve come across a variety of ways to represent the flow and design of an application. I have gone from paper to whiteboards to Visio to combinations of all of the above and more. What I’ve discovered is the digital formats take too long to accomplish anything so they are more of a final design asset rather than the means to get to the desired result. 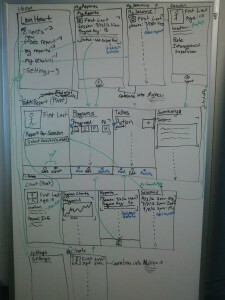 Whiteboards are my preferred medium for sketching wireframes and information flow. Microsoft has one of the coolest examples of wireframes participating in the flow of information called an Information Map. The example image on the aforementioned site is not the highest quality, but it demonstrates the intended purpose. As I mentioned earlier I don’t like going to a digital medium because I feel it takes too long to make it worth while. But I am a huge fan of the whiteboard so I’m including am image of the information map of LionHeart that I created on a whiteboard. Thus, digitizing my whiteboard information map. It’s not beautiful but it conveys the idea clear enough that I feel little to no need to rework it using Visio or some other pretty digital designer. There are just a few important items to mention here. First, the Windows Phone platform has some strict navigation rules namely the back button always goes back to the previous page. There are times this rule can be ignored such as when going to a settings screen and selecting save. Hitting the back button after selecting save should not return to the settings screen in most cases. Essentially any screen that is treated more like a modal dialog should not be returned to via the back button. These cases should be called out in the information map. Second, certain UI aspects should be called out such as multi-select lists, pivot or panorama control, or other controls using none intuitive interactions (based on a static drawing). Finally, remember that these information maps only take the UI aspect of the application into account. Do show the layout to some of your colleges or potential consumers and make sure the flow of the app cuts down on as many touches as possible to accomplish what is important. Once the information map is complete then it’s time to move on to the project structure and start coding! This is an entire different beast. I will not be covering this topic now. Perhaps at a future time. Admittedly, code architecture is one of those religious wars that I absolutely LOVE to discuss. For now I will only say that after you have an information map completed decide on what models exist and what VMs exist. Remember if commands will be used for buttons such as with the BindableApplicationBar that VMs should be used. Also, take into account if you will be using IsolatedStorage or the local application database. LionHeart is designed around IsolatedStorage for purpose of its demo. A really good analogy to this is how HD TVs have changed the TV industry. Imagine for a moment that a website site is the film, and the TV is your browser. If you had a black and white TV, you wouldn’t expect to see the film in color. If you have a standard definition TV you don’t expect to see the full wide screen movies, and if you have a widescreen 720p TV, you don’t expect to experience the full effect of 1080p Blu-ray. Filmmakers don’t shoot in standard definition and then try to ‘upgrade’ the film to HD quality. Its pointless and a LOT of extra work. No, they shoot with the best film and resolution they can afford and then cut it down to the lower denominators when or if they support older formats. In the same way, if you use an older browser you wouldn’t expect to get the full experience a modern browser supplies, and moreover, you likely wouldn’t even know what your missing! You don’t expect it since any other site you visit also doesn’t have those features or details. Because of this, you should be designing for the ‘1080p’ of the web, and accept that users with older browsers will still get the ‘standard definition’ experience. There’s also an important distinction between print and the web. The web is dynamic and fluid, highly interactive. The web is also delivered on a range of sizes and devices, from something the size of a business card up to large 30″ monitors. There comes a point where form and function have to merge in a non-trivial way to provide an experience that fits itself to the users needs, when they need it, the way they need it. Print is extremely static, once it’s designed, it stays that way. If you design a poster, you design it to be printed at a certain size or at certain proportions. If you design a book or a magazine, you have total control over the size and layout of your spread. If you continue to think about the web this way, you’ll miss much of the dynamic nature of the web that makes it attractive as a medium. Its only recently we’ve really gained the tools and techniques we need to REALLY break out and away from the classic printers layout due largely to the rise in mobile devices, HTML5 and CSS3. What I’m calling this “Print Format” tends to reveal itself at the extreme edge cases. On large monitors where content will appear tiny and hard to read with lots of extra white space. On small monitors or mobile devices when the content doesn’t scale down and your forced to scroll back and forth to read. Over the years one of the only real solutions to address this, if someone addressed it at all, was just to never set a width for your content and just let it fill your entire screen. Although this almost works for some things, it’s difficult to read as paragraphs will stretch across the screen. You will constantly lose your place as your eyes track back and forth to the beginning of the next line. Also, if your designing a static site and you and your designers both have large screens, it’s easy to ‘fill up the space’ with ancillary or useless content and ads to make the site feel balanced. All in all, most so called solutions were hacks on a broken system. No matter what browser you visit it on, or what size your browser is at, the content will be sized appropriately, the typography will be readable, and everything will feel right. Sans insane urges to resize your browser window. One of the key benefits to designing a fluid theme is the instantly correct look you get when you open the site. Its not something people will or should consciously expect, it should simply BE the correct size the instant it appears, regardless of size, screen, or orientation. Its like walking into a store. A well designed building is easy to navigate, spacious, and consistent across all other stores you visit regardless of size. You don’t ever think about it, you’re not there to analyze the layout of the store. You’re there to buy groceries. Anything that gets in the way or makes it hard to find what you’re looking for will stick out, and if it’s bad enough, you’ll go somewhere else. Its the same way with a site or blog. 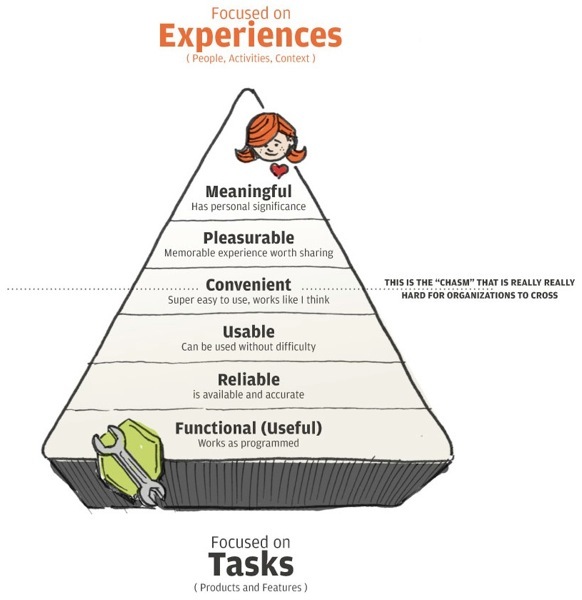 Users are there for a reason: For information, or to read, or to consume whatever content you are serving up. They didn’t come to analyze your site and how it’s designed, but if they have any difficulty at all in getting to what they want in whatever form they want it in, they’ll be somewhere else in about 8 seconds. It’s also important to be intentional about the decisions your making and how they will affect the final layout of a site. The more you reduce the complexity of the interactions, and the better defined the interactions are, the better the final end result will be. Use what you design. Do what your users do. You’ll know best what you do and don’t like and what feels right. Go with it, but don’t be afraid to stop, backtrack, or even completely scrap good ideas if they don’t fit with what you expect from the design. Something that’s going to become really important is to start out your design efforts knowing your designing for a fluid site like this. Laying out the groundwork and page structure is going to be extremely important to your long term sanity as a developer. There’s this concept in computer science called emergent behavior, essentially, the less you specify about a system, and by imposing fairly simple rules you can get easily get complex behavior. By starting with the containers, and then working your way to the content I have much less to worry about since most of the content takes care of itself without much more intervention from the developer. If your someone who already has a well established, static width layout, its going to be difficult to establish a well behaved fluid grid system without tweaking MANY aspects of the site. Its probably why a lot of companies simply serve up an entirely different set of HTML and CSS for the site for mobile devices: Its easier to do than to rebuild their main site to scale all the way down to small screens.